What kind of noise are you making -- an indistinguishable hum or an instantly-recognized, Harley-like roar? No matter what business you’re in, your target customers can’t see any meaningful differences between you and your competitors, which is why they’ll buy from whoever offers the lowest price or is the most convenient. Like each player in your industry, you’ve tried every flavor-of-the-month fix available – like “re-branding” and social media – to lose your commodity status, improve your competitiveness, attract customers and keep them loyal to you, but came up short. Hear that hum? Ride along with him and use his proven, step-by-step instructions to become the best positioned, most dominant and sought-after player in your market. And reap the benefits of fiercely loyal, passionately vocal customers -- that Harley-like roar -- and a work culture hell-bent on keeping them that way. Even if you’re in a dull, unsexy industry. As director of communication for Harley-Davidson during the pivotal years of its acclaimed rags-to-riches turnaround, it was Ken’s job to improve the motorcycle legend’s blackened reputation, create demand for its products and attract big-time investors. Spectacular success gave him an all-access pass behind executive doors the world over, so much so that since leaving Harley he’s worked with more than 1,000 businesses in every imaginable industry and became one of the most demanded advisers, thought leaders and keynote speakers alive. His passion is as contagious as his energy. With a little help from Ken’s favorite teaching tools – motorcycles – “Make Some Noise” will show you how to: Make competing to dominate your business’s primary objective; Create bulletproof positioning and influence marketplace narrative; Uncover and promote your business’s hidden inimitable strengths; Harness the power of a work culture that’s driven to please; Generate tattoo-worthy loyalty among your important publics; Convert customers into passionately vocal advocates who will bring you new customers; Vastly improve your leadership skills, and; Exploit Ken’s failproof “secret ingredient” for improving like-ability. Further giving “Make Some Noise” must-read status are the facts that it’s as applicable for improving your personal competitiveness as it is for your business, it’s buzzword-free and surprisingly entertaining from start to finish. Make Some Noise doesn’t mess with vague business theories, or worn-out cliches, but instead offers simple, powerful ideas and actions that can lead every business, big or small, down the road to greatness. Like the rumble of a Harley, its message is immediate and can’t be ignored. I love this book! Former President, Trader Joe’s, Inc.
Make Some Noise underscores what science has proven time and again: the best marketing and promotion is what people say about you. Ken digs in to the key questions, what do you want people to say about you and what are you willing to do get them to say it? Full of smart advice and great stories, you won’t be able to put it down. You won’t see it coming. But out there is a well-financed startup or global death star that wants to turn your company into a faceless, profitless commodity supplier. If this scares you – and it should – buy a copy of Make Some Noise. 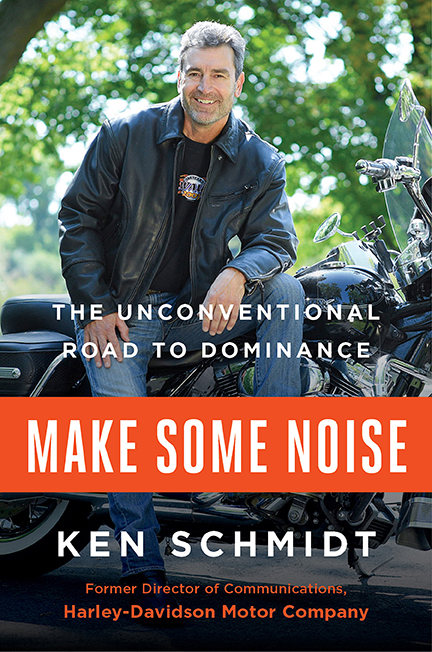 Author Ken Schmidt teaches you the unconventional branding road he navigated as communications director at Harley-Davidson during its fast-growth years. Every entrepreneur and marketing professional should read and absorb the lessons in Make Some Noise. Ken Schmidt’s guide to gaining customer loyalty makes a loud statement about the need to avoid commodification based on price, and offers truly useful insights built on the fact that the only marketing and messaging that ultimately matters is how customers see you and what they then say about you–based of course on how they experience you. During my 32 years on Wall Street with the last dozen or so overlapping with my role on CNBC’s Fast Money, I’ve been exposed to countless people that make noise for the sake of making noise. Ken’s book illustrates with real life experience the correct way to make noise while rising above the cacophony of mindless sound that permeates and intrudes upon our everyday lives. This book moves as gracefully as a Harley Road Glide without sacrificing its roar. Ken Schmidt is one of the few people I know who’ve truly seen what happens to a business when it doesn’t separate from the pack and boldly live a unique point of view in a super noisy way. His learnings are fiercely relevant for everyone from entrepreneurs trying to get a foot hold to mid-level managers looking to stay ahead of the pack. And most importantly his stories that teach his methods are wildly entertaining. Jump on board his bike and see for yourself! Man, what a fun and surprising ride! Make Some Noise combines Ken’s contagious passion and unforgettable storytelling with a road map of step-by-step instructions that can make any business — and any person — a dominator instead of an also-ran. Trust me, making noise flat-out works!